Just today a friend of mine narrated an incident of theft which happened at her friend’s house. Thankfully her friend was not at home during the incident. The culprit made off with their cash, jewelry and small electronics items. Even though I did not know the person in question personally, it gave me goosebumps. The culprit was none other than their trusted maid, who fled the crime scene. That’s why I had the goosebumps! I then began to read up about maid related crimes and as I guessed, a plethora of cases were right in front of me, which were barely a few months old. More than 700 criminal acts are committed across the country every year by domestic helps! Pune – Domestic help held for stealing ornaments from techie’s flat. Mumbai – Domestic help held for stealing cash, valuables worth INR 7 lakh. Mumbai – Double murder of elderly couple in Khar shocks locals, domestic help missing. Delhi – 50 year old woman murdered, domestic help missing. Easy access to their victims and the numerous opportunities to attack makes domestic helps dangerous just as criminals are. Everyone is vulnerable: those living in high-security high-rises, condos, apartments or independent bungalows across all cities PAN India. What I found was common in all the above cases was the domestic help was missing after the crime and from the crime scene. Furthermore, to make matters worse the employers had not got the necessary verification done. While the police are often blamed for the rising crime rate, in such cases it is often the employers who fail to take adequate measures and get a criminal verification done. This scenario is not only frightening but dangerous too. At present there will be very few ‘maid free’ households in urban India. With rapid urbanization, there has been an influx of white-collar professionals and rising number of working couples. This has triggered a steep upward demand for domestic helps. When I say domestic helps, I specifically mean maids/ house helpers. They could be either male or female. 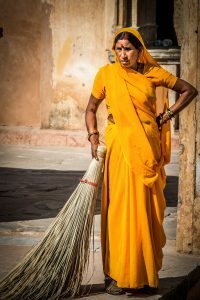 They are generally employed to work on a full-time/ part time basis and also made to stay in the employer’s house for the convenience of the employers (in case of full time helps). We are quick to blame the government, the authorities, the police and all and sundry. Have we ever thought, aren’t we to be blamed! When we don’t take our own security and safety seriously, how can we expect others to? We welcome these strangers into our houses, into our lives, entrust our children, our elders in their hands and we don’t even bother finding out who they are and what their background is! We are in such an hurry to employ help that we overlook even our safety and the security of our loved ones and our precious homes. In most cases that were solved, I realized that the crimes committed by the domestic helps were meticulously planned. They weren’t spur of the moment, but were planned and executed carefully. We would also like to list down a few do’s and don’ts while employing a maid/helper. • Maids/helpers should not be appointed based on mere references made by their acquaintance or relatives. Good ‘references’ are not enough. Some who come with a good reference might be tempted to steal if they are exposed to temptation. • Collect the details of the Maids/helpers, including photographs, IDs, address and details of previous employer and contact us at JantaKhoj Infoservices. We shall assist you in the verification process. • Avoid giving access of your home to the relatives/ friends of Maids/helpers. • Avoid displaying jewelry, cash and other valuables in front of them. • It is advisable not to talk about money or monetary transactions you are going to make, in their presence. • Treat domestic servants with dignity. • Keep your maid/helper under close observation at all times for any undesirable or suspicious activities and take action accordingly. • Never let your maid/helper know the place where cash, jewelry, valuables and important keys of your house including keys of your cars are kept. Verify your domestic help/ maid! Keep yourself and your family safe. It’s better to be safe than sorry! We at JantaKhoj are always at your service! We are just a call away.